Humanity in the world of Azeroth is at once an old and young race. Old because they can claim direct descent from the ancient Vrykul, creations of the Titans. Young because they were born out of the Curse of Flesh and the exile of those who were stricken with it. Led to new lands, these cursed Vrykul children would in time grow into the race of beings we know today as Humanity. Many thousands of years after their arrival in the land, long after the War of the Ancients split Kalimdor apart, one man rose to become the unifier of the brawling sons and daughters of that group of exiles. Named Thoradin, he would first battle his own people, then alongside the High Elves of Quel’Thalas in the Troll Wars. When he was done, Humans would have a nation of their own, would stand as a power capable of defeating the powerful Amani and making pacts with the ancient Quel’dorei. But that wasn’t the end of Thoradin’s story. His quest to uncover the origins of his people would find him exploring a place of shrouded nightmares in the heart of what many believed to be Humanity’s golden beginnings. There are spoilers for Legion in this KYL. We know little about Thoradin’s origin. He was a barbarian at a time when “barbarian” was just a standard descriptor for the state of Humans as a whole. At the time, Humans dwelled in tribes which made constant war against one another, battling for the parts of what we today call Lordaeron that weren’t already claimed by the High Elves and Trolls. Thoradin was a weaponsmith as well as a warrior. 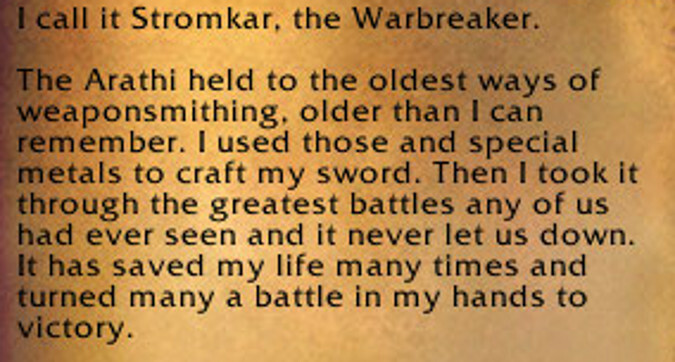 He forged his sword, Strom’kar, using the ancient secrets of the Arathi tribe passed down from the time of the mythical Tyr, a maimed god or godlike being who led the Arathi and other humans from their ancient and forgotten homeland. 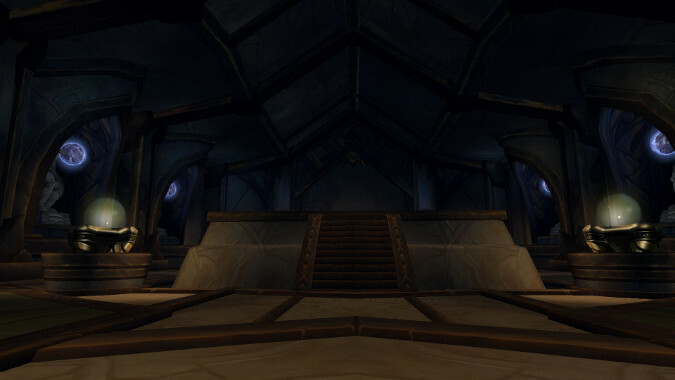 There was little to distinguish either Thoradin or his people, the Arathi, when he rose to power. Whether Ignaeus and Lordain were Thoradin’s brothers by blood is unknown. We know Anduin Lothar is considered the last descendant of Thoradin’s bloodline, and is often called Last of the Arathor, but that has to be a figurative title because while the Trollbane line does not descend from Thoradin, it absolutely does descend from Ignaeus. Was he not originally an Arathor? After all, Thoradin conquered and united many tribes under the Arathi banner. It’s possible Ignaeus and Lordain were the leaders of other tribes that joined with Thoradin willingly, or even saw the wisdom in his plan after having originally opposed him. 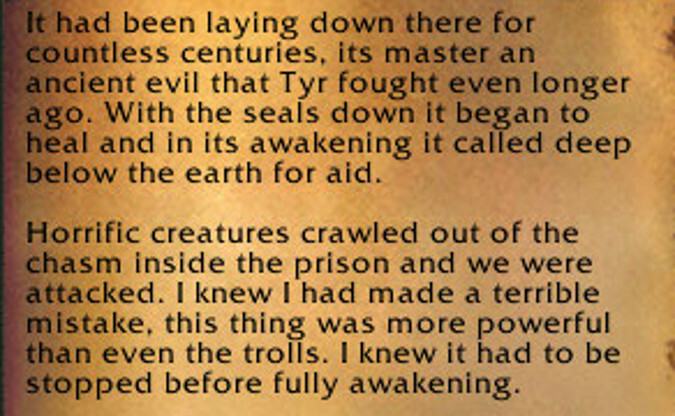 What we know, as attested by Thoradin himself, is that the war with the Trolls nearly destroyed Humanity even before the alliance with the High Elves. After that ancient pact was struck, Thoradin committed the whole of his young kingdom to the battle with the Amani, and even with the aid of the High Elves they were nearly destroyed. Only through the magic taught by the High Elves and the sacrifice of countless Human lives, including that of Thoradin’s friend and “brother” Lordain. By the time the Troll Wars finally came to an end, Thoradin was no longer a young man, but a seasoned warrior king, a statesman who negotiated with the High Elves on equal terms, and moreover, he was tired: tired of ruling, of uniting his people, of leading them in war. Thoradin had seen Humanity at its best and its worst. He’d created a kingdom for them and left it with his heirs to rule and guide it. He’d lost Lordain, and his friend and brother Ignaeus was busy founding a line of his own. So Thoradin’s thoughts turned from survival to the mystery that struck at the heart of Humankind in those days — where did his people come from? Who were the Arathi and the other Human tribes? The Elves, the Trolls, they had ancient stories of their past glories, of their ancient heritage. What was the heritage of his people? And so Thoradin took up the sword Strom’kar and, leaving his kingdom to his successors, he strode forth to find out the answer to this question. And find it he did… eventually. Thoradin had many adventures before he finally found what he sought, in the distant fringes of his new kingdom, a place known as Tirisfal. After much exploration, Thoradin and the select few of his retainers who had accompanied him, including some of the new Mages trained by the High Elves, discovered an ancient structure built beneath the glades of Tirisfal. Amazed that his long quest to discover the origins of Humankind might finally be at an end, he ordered his Mages to help him breach the seals on the ancient tomb. The structures buried beneath the lake were gigantic, wrought by enormous hands. And soon the Arathorians found out why — for entombed in the sepulcher lay a being like unto a god, with a clenched silver fist for a hand — the Titanic Watcher Tyr, the being who had brought the ancestors of Humanity to the land known to us as the Eastern Kingdoms. But Thoradin didn’t have long to celebrate having at long last discovered the truth of the legendary Tyr, the being whispered in legend by every tribe of Humans, he who Tyr’s Hand was named for, because Tyr wasn’t the only thing buried in that crypt. Tyr had originally come with Archaedas and a band of Vrykul who were confused and upset by the actions of Loken, the Prime Designate selected by the Titans to watch over Azeroth after they defeated and imprisoned the Old Gods. Tyr suspected that it was one of these beings, the dread Yogg-Saron, who had been behind many of Loken’s recent actions as well as the Curse of Flesh that was now bedeviling the Vrykul. Tyr saw the injustice in the Vrykul exterminating their own children in panic when they displayed signs of being born smaller and weaker than themselves. Together Archaedas and Tyr stole the ancient Discs of Norgannon from Ulduar and fled to find Uldaman, another Titan facility they could use as a last bastion against Loken’s machinations. 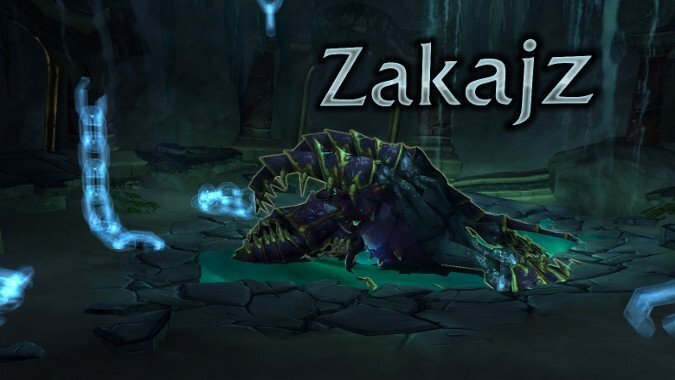 But they failed to grasp just how far Loken had fallen into darkness, and the Prime Designate sent one of Yogg-Saron’s most loyal servants, a Cthraxxi Abomination named Zakajz the Corruptor, to find them and regain the Discs of Norgannon before they could unlock the secret of his plan to free Yogg-Saron. At the head of a vast pack of monstrosities, the creature found them, and Tyr sacrificed himself to ensure the safety of his friends and allies, falling in battle while simultaneously destroying the Corruptor. But Corruption rarely dies easily. With the seals on the tomb destroyed, Zakajz began to stir, and his servitors rose from the deep earth to help free their master. Thus Thoradin was presented with his ultimate trial — through his own curiosity he’d awakened an ancient evil, a force so monstrous it struck down the being who Humanity still thought of as their patron god. There was only once choice, and Thoradin and his retainers fought their way deep into the crypt, until only Thoradin himself was left alive. Thus died Thoradin, first King of Arathor, lord of Strom and ruler of all Humanity. But he did not die feebly or in vain — his last moments were spent burying his mighty sword Strom’kar in the brain of the Cthraxxi. Whether it was the ancient weaponsmithing techniques, the unique metal of the blade, or the magic placed in it by a grateful Quel’Thalas, the sword proved capable of halting the beast’s regeneration. But with recent years seeing the Old Gods ever more active, servants of the terrible ones began to make their way to Zakajz, and the beast began to stir thanks to the interference of the Twilight’s Hammer. Still, although he died doing it and never managed to share his knowledge with the world, Thoradin did discover the resting place of Tyr, he of the Silver Hand, who led the cursed Vrykul offspring to the land they would one day rule. Tirisfal was named in honor of his heroic last stand against the minions of Loken’s master Yogg-Saron, and his name would pass on into human legends. Every modern nation of humanity would owe its existence to the life and achievements of Thoradin of Strom, and it would be his descendant Anduin Lothar who would remind a forgetful Quel’Thalas of the debt they owed his illustrious forebear, and in so doing perhaps save Azeroth from the Burning Legion itself. Rest well, Thoradin. Your sword will soon be taken up in defense of your people, and the entire world.